Concentrate efforts to locating thick weed bests in main body of lake for Perch. Jig slow and steady with Pete’s Sassy Stinger and a wax worm. Pike have been caught with smelt under a tip-up. Salmon fishing is productive 10-20’ below ice. Hali’s are best with maggots. Decent Rainbows are caught using VMC Tingler Spoons. All launches are still frozen over. Lake Trout are caught in Somers Bay way out by island in 40-60’ of water. Use a white bucktail with cut bait for best results. East Bay doing well for Perch. Good Salmon fishing front of Paul’s Memorial launch. Depths vary from 20-60’ so work back and forth focusing about 15’ below ice. Use a pink/white Hali Jig with maggots. Perch are hard to find but get rewarded with pound plus fish. Perch fishing is on for about 2-3days then slows for a couple days. Be on the move on slow days and downsize bait presentation. When fishing in deeper water, look for suspended Perch. Salmon fishing has picked up before daylight. Great place for kids to catch Perch! A few decent Rainbows being caught close to shorelines or in deeper water suspended. 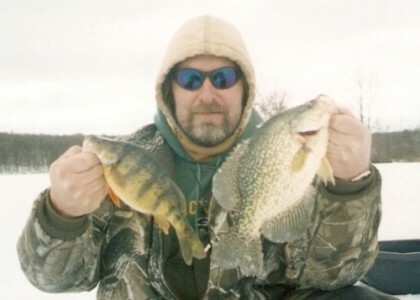 Larger Perch have slowed, and they are down in thick weed cover. Downsize bait like a glow Demon and drop shot it. Smaller Pike are being caught on tip ups with whole smelt. Smaller Lakers are found on bottom in 60’ water. Use a 3/4oz white jig head with a glow white twister tail and small ribbon of cut bait. Large Lakers can be found deeper but less abundant. Pike fishing has slowed a little. Perch are full of eggs so downsize to a Skandia Tungsten jig in a fire tiger pattern. No electronics? – Use a small bobber and set the hook on the slightest movement. Look for suspended Perch about 30’ below ice. Perch on the bottom do best with small Demons and drop shot. Fish for Pike around bull rushes, same with Rainbows. Salmon fishing is best on Crystal in early mornings.